Linda Burton posting from Tallahassee, Florida – “This plaque is dedicated to Senator Lee Wisenborn whose valiant effort to move the Capitol to Orlando was the prime motivation for the construction of this building.” A touch of humor, and a telling dedication. 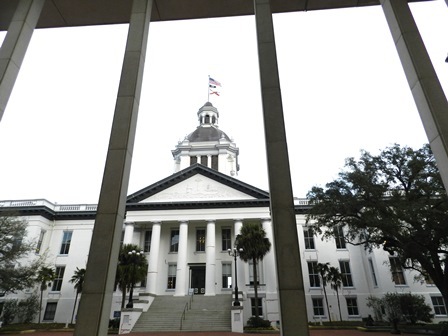 The nontraditional Florida capitol is the newest in the country, a modern 22-story tower that rises 307 feet from the public entrance on the Plaza Level to the Observation Deck. 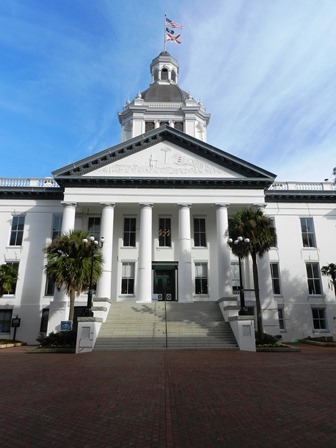 It is the fourth building to serve as Florida’s capitol; officially dedicated March 31, 1978. Immediately after its opening, restoration began on the Old Capitol, which sits in front of the new “like a jewel,” with white columns, picturesque grounds, and (although they were down the day I was there) red-striped awnings over the windows. The Old Capitol is a museum today, refurbished to its 1902 appearance, but it was almost bulldozed during the controversy over how to gain space, and where to do it. 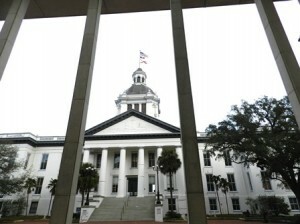 Tallahassee is not centrally located in the state now, but it was in the beginning. The Spanish colonies of East Florida and West Florida had capitals in St Augustine and Pensacola; the establishment of Florida territory in 1822 merged the two. The first session of Florida’s Legislative Territorial Council met at Pensacola; members from St Augustine traveled fifty-nine days by water to attend. 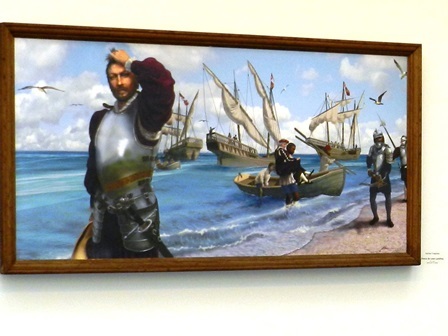 The next year they met in St Augustine; western delegates traveled around the peninsula on a twenty-eight-day trek. That’s when they agreed on a halfway point, and that was Tallahassee, an abandoned Apalachee settlement. 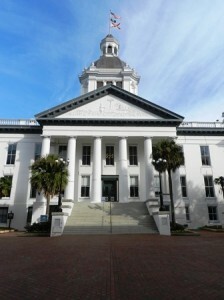 The third session, in 1824, met in a log-cabin; the precedent was set for Tallahassee as capital city. A two-story structure replaced the cabin in 1826; the third capitol was completed by 1845. And the fourth I’m standing in today, despite the “valiant effort” of Senator Wisenborn. The Wisenborn plaque is affixed to the north wall facing the elevators. At the security desk I had been advised to go straight back to the Welcome Center; it’s part of Visit Florida so that’s where you learn about the capitol, or any other spot in Florida you might want to visit. At the visitor desk, I had been advised to start my self-guided tour on the 22nd floor, in the observation deck. 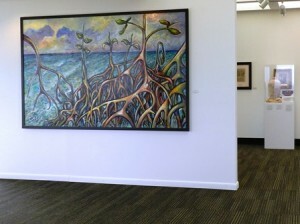 So to the elevator and up to a bright and sunny view; there were a few sitting areas tucked in corners here and there, and art gallery space displaying paintings and sculptures. The walls were a simple white; it was a comfortable spot to browse. 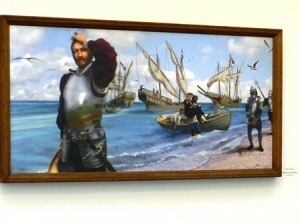 I passed a painting of the Landing of Ponce de Leon; and then a modern piece – was it mangroves? Outside, Florida spread out into the distance; I noticed church spires lined up downtown and the Florida State campus to the west. The express button in the elevator took me down to 5 for a peek at the Senate and House Chambers; between the two a balcony had Florida Facts carved into the edge, clearly visible from below. Florida was admitted to the Union March 3, 1845 as the 27th state. Florida is 447 miles long and 352 miles wide. Florida’s nickname is the Sunshine State. Florida’s state flower is the orange blossom. Florida’s state pie is key lime. My favorite pie, I thought. I couldn’t get into the House chamber, but I could see into it; it seats 120 Representatives in modern style; a faux-alabaster-and-glass chandelier is above; deep blue carpet below. The wall features eight murals showing Florida’s history and two murals depicting underwater scenes – one freshwater, one saltwater. 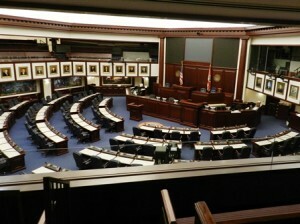 Floor action is filmed with the help of the Florida Channel’s robotic cameras; a stadium-style TV screen is located on the back wall above the speaker’s rostrum. On either side of the screen are the voting boards, displaying the names of the representatives, and bill information. Each desk is equipped with three buttons – red, green, and yellow; red for a nay vote, green for a yea vote, and yellow to summon a House page or messenger. 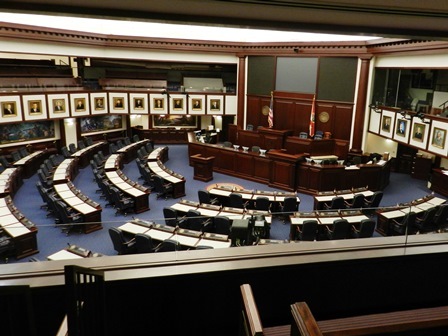 Florida has 40 senators; the Senators have a 4-button system on their desks; an additional white button notifies of a phone call from their office. Robotic cameras here too, used by the Florida Channel; the glassed-in areas above the entry are for the press; there is ample seating for visitors. 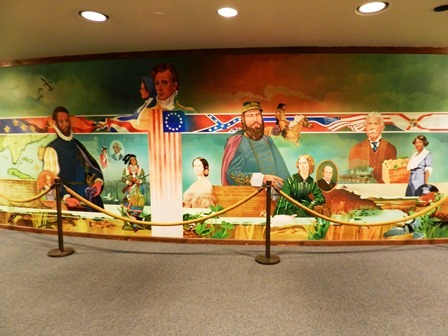 Paintings of former Senate Presidents surround the chamber and in the hallway outside a mural depicts some of Florida’s historical figures, as well as Florida’s flora and fauna, as envisioned by John Audubon. 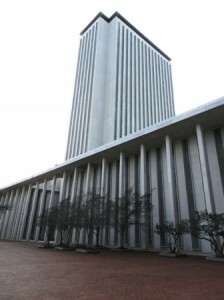 This tall building has plenty of space for offices; the Governor, Lt Governor, Florida’s elected cabinet, the Attorney General, the Chief Financial Officer, the Commissioner of Agriculture. There’s even a chapel; it is available for weddings and baptisms. The building’s design is “New Classicism,” very different in style from other state capitols, and from the Old Capitol that served the state from 1845. Over an acre of travertine marble imported from Italy was used on the walls; terrazzo was used on the floors. The Legislative Chambers are actually in separate four-story buildings on either side of the main building, but they are connected by skywalks; from the inside you are almost unaware of the transition. There is no mortgage on this building; all needed funds were appropriated before the cornerstone was laid. Total cost was $43,070,741 with an additional $1,957,338 spent on landscaping. Waller Park is out front; the centerpiece of the park is Stormsong, a sculpture of a pod of playful dolphins. I tried to get good pictures of the state seal from the balcony; it dominates the rotunda. I kept getting a reflection of the overhead lights and called to the security desk below to ask if there was a better spot where I could stand; it was suggested I try various angles around the balcony. I gave up my quest when I realized the picture in the printed materials I’d been given had the same glare; time to focus on the symbols in the seal instead. The center seal is the one in use when the capitol was built (see below). The five smaller surrounding seals represent the major powers in Florida’s history – France, Spain, Britain, the Confederate States, and the United States. Images of the Sunshine State are the murals on the Plaza area; bright Florida colors are used to show the Kennedy Space Center, a scuba diver, pine trees and palmetto scrubs, an orange peel cut into the shape of an orange blossom. 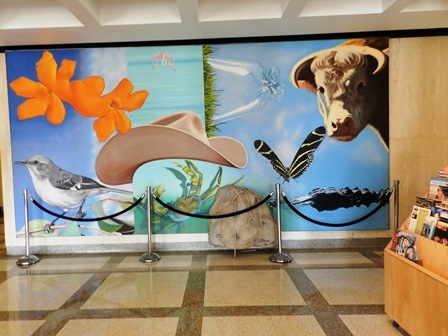 The mockingbird, the alligator, and the longwing butterfly are state animals; the cow represents Florida’s cattle industry; the crab represents the seafood industry. A rock and a rope represent the balance that must be maintained between industry and nature. 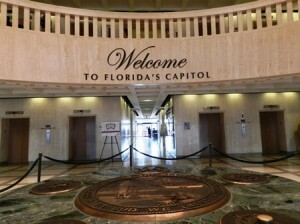 I snapped a picture of the Old Capitol from inside the new before I headed across the walkway to visit there; everything was tucked neatly together, and still in Tallahassee. 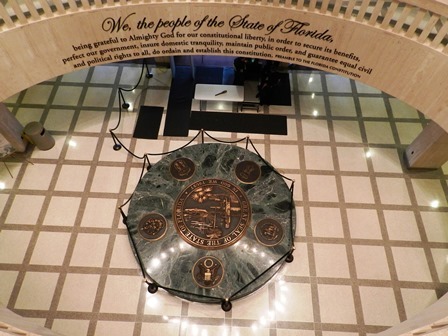 The elements and basic design instructions for Florida’s State Seal were established by the Legislature in 1868. The Legislature specified “That a Seal of the size of the American silver dollar, having in the center thereof a view of the sun’s rays over a high land in the distance, a cocoa tree, a steamboat on water, and an Indian female scattering flowers in the foreground, encircled by the words, ‘Great Seal of the State of Florida: In God We Trust’, be and the same is hereby adopted as the Great Seal of the State of Florida.” In 1970, more than 100 years after the first specifications were drawn, the Florida Legislature made one change in the official description, changing “cocoa tree” in the former language to “Sabal palmetto palm.” The sabal palmetto palm had been designated as State Tree in 1953. In 1985, a new design corrected several errors, using the image of a Seminole Indian woman rather than a Western Plains Indian; providing a more accurate image of the steamboat, and changing the cocoa palm to a sabal palm as the Legislature prescribed in 1970. It is the 1970 design that is displayed in the rotunda of the capitol.